resistive fabrics tend to have an increasing resistance across distance and are great for making potentiometers and location sensors. Piezoresistive fabrics are often also resistive across distance (x,y) but have a resistance that decreases under pressure (mechanical stress) through the material (z). These materials are great for making pressure, bend and often stretch sensors. There are a range of resistive fabrics available on the market, often sold for anti-static and electromagnetic field (EMF) shielding purposes. 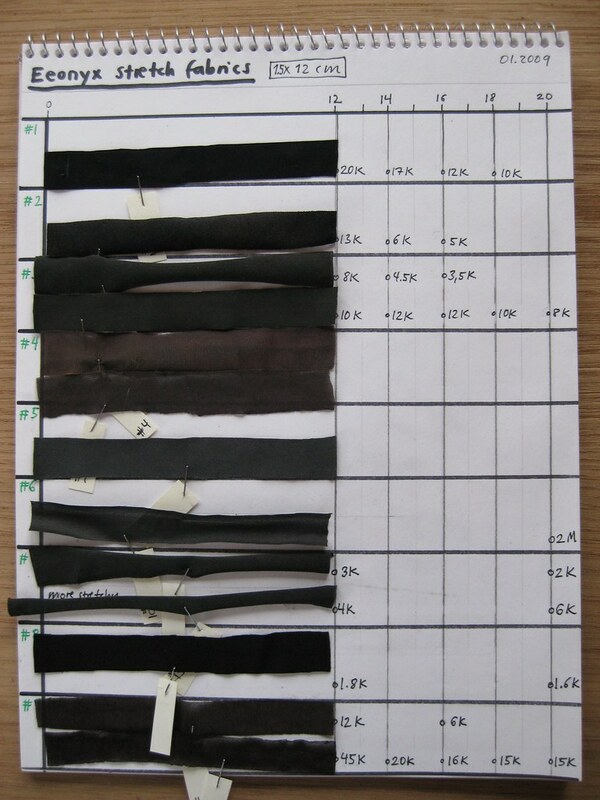 One range of piezoresistive fabrics are made by coating regular fabrics in an inherently conductive polymer. These are patented processes and so far I know that Eeonyx and Panipol are two companies producing such polymers. 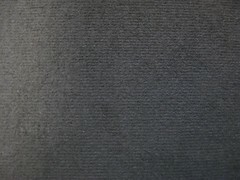 Marktek retails EeonTex fabrics. Eeonyx is a company that has developed a propriety coating system with which they can coat almost any fabric (wovens, non-wovens, felts and knits of polyester, nylon, glass, quartz, spandex, polyolefins, and aramids) in an inherently conducting polymer (polypyrrole, PPY). 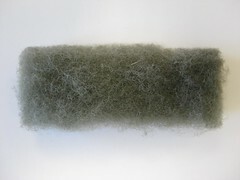 The coating uniformly covers the individuals fibers of the fabric, making them conductive/resistive and also black or dark gray, but the feel of the fabric itself remains pretty much the same as the coating process barely affects the strength, drape, flexibility, and porosity of the starting substrates. 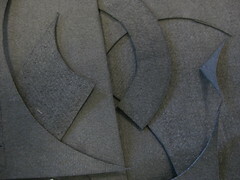 Depending on the base fabric, EeonTex fabrics can possess surface resistance between 10 Ohm/sq and 10 billion Ohm/sq. Unfortunately Eeonyx does not supply free samples or small sample orders any longer. But HITEK now sell Eeonyx fabrics in small quantities (1m)!!! The numbers in the first image correspond with the material data in the second image. Passed on to me from Eeonyx. 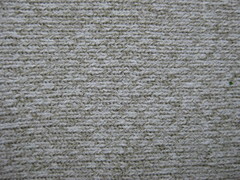 A knit fabric from green/white yarn mixed with a restive thread. 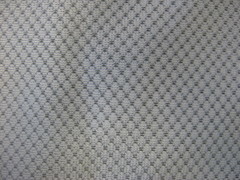 This fabric sold by LessEMF has resistive fibers woven into it in a diamond pattern. 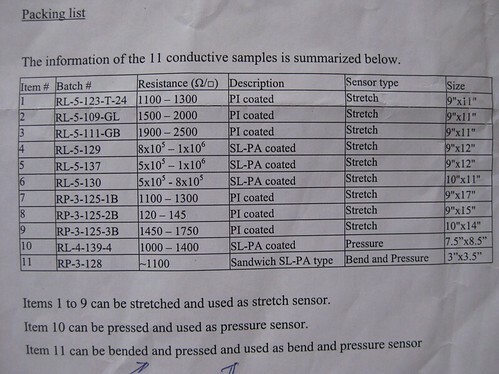 Unfortunately this fabric is not able replace velostat in the pressure sensors, since it is very unstable. 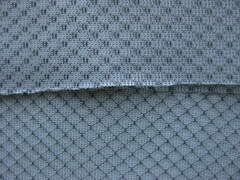 A black woven fabric with a white non-conductive backing. It is sensitive to pressure, about 200 – 30 Ohm per cm, depending on how hard I pressure the measuring points into the fabric. The following stainless steel and polyester yarn also has piezo/resistive properties. Hi, can i ask if you’ve any idea to get the material, velostat? I don’t need so much of it, just a little will do. And is Linstat’s functionality similar to velostat? I’m currently looking for this material urgently, would appreciate if you get back to me asap. Thanks! here you will find all the details! Hi, does anyone know were I can get resistive fabric in the UK. It would be for a potentiometer? I can’t actually find any of these for sale… Thanks. unfortunately i don’t know of an Eeontex distributor, but try emailing them for samples. AnHui Lineo New Material CO.,LTD in China is here. The good quality and the competitive price we have. If you have any questions, please do not hesitate to contact with me. Hi there, I’m trying to work with a glove that needs to let me know how much the hand is flexing. i.e. clenched fist, or open palm sort of thing. 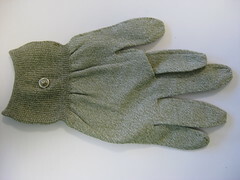 One way is to use bend sensors or just strips of resistive fabric, but in your opinion, what if the whole glove was not neoprene, but resistive fabric? Do you think there would be too much noise? I imagine the calibration would take some work, but if you’ve had any experience with it, I’d love to hear. i would love to hear your input! Can anyone tell me from where(Website) can I buy this in India? I am trying to make a breathing monitor for biofeedback. Deep breathing lowers blood pressure, it seems. So I would like to measure chest expansion and need a strip of material to incorporate in a band – what would you advise? I propose to use either my Raspberry Pi for the electronics, or perhaps an Arduino for a portable version. HITEK Electronic Materials are the UK distributors for Eeonyx materials. 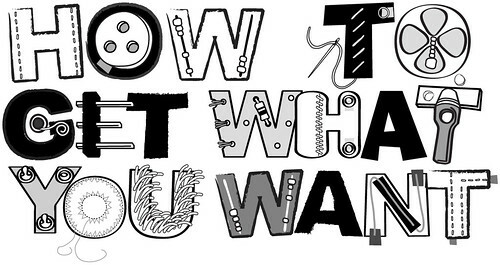 We would be happy to talk to any customers about the range of resistive fabrics.